We are being noted for providing our clients with a comprehensive range of Vertical Scaffolding Pipes. In Scaffolding, we establish mandatory requirements and advisory guidance for scaffoldings used at unit/site facilities, including projects in conjunction with local regulations, consensus standards, manufacturers’ recommendations, site specific procedures and training programs to help achieve safe scaffold erection and use. 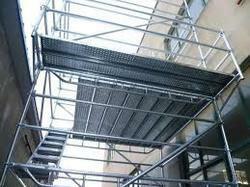 Scaffolding Management System maintains all the records of current scaffolding work on the site. Its scheduler keeps track of the erection starting date, per day inspection, scheduled inspection, completion date and dismantle date. It also keeps history of reporting records.